In September, Zen Mountain Monastery hosted the biannual conference of the Soto Zen Buddhist Association for three full days of practice, discussion and exploration. Close to 70 ordained priests and transmitted teachers joined the conference, representing dozens of training centers and sitting groups throughout North America. Following the conference, we spoke with Tenku Ruff who serves as the president of the SZBA Board of Directors and was very involved in the organization of the event. CLICK HERE to see photos from the conference. Tenku Osho trained in Zen monasteries in Japan and North America. She was ordained by Tessai Yamamoto, Roshi, and received dharma transmission in the same lineage. Tenku holds a Master of Divinity degree from Maitripa College, a Tibetan Buddhist graduate school in Portland, Oregon. She is also a board certified chaplain (BCC) with the Association of Professional Chaplains and has worked as a hospice chaplain and a palliative care chaplain. Oncology, end-of-life care, and grief support are her primary areas of focus as a professional chaplain. 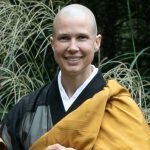 In addition to her work with SZBA, she is a member of the Buddhist Council of New York, the American Zen Teachers Association, the Association of Soto Zen Buddhists, the Association of Professional Chaplains, and she served as chairperson of the 2017 Generation X Dharma Teachers steering committee. She leads the Northern Westchester Zen Center not far from New York City.